Anyway, being of a sociable nature, the Hot Wings like to get together. 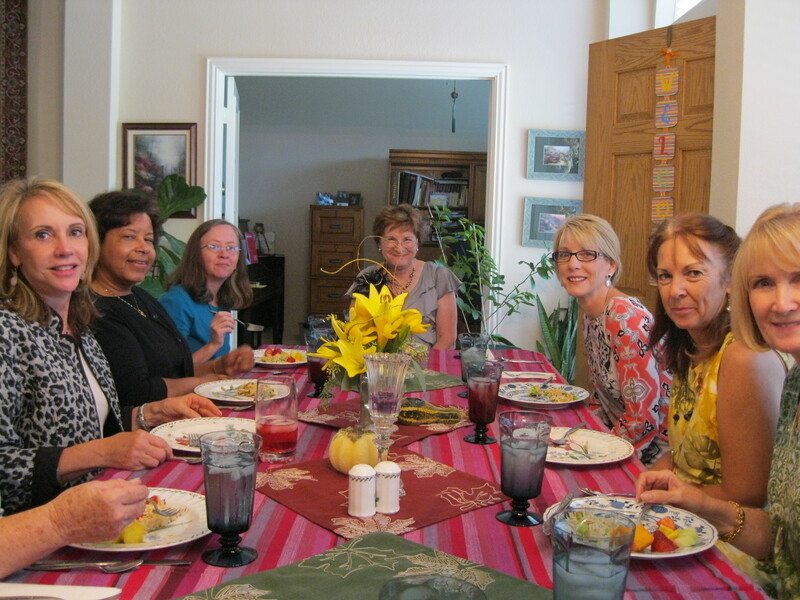 Last Sunday, we had a little after-church luncheon for something called a “Japanese Stack.” We signed up to bring various ingredients and were all wildly curious as to how they would go together. 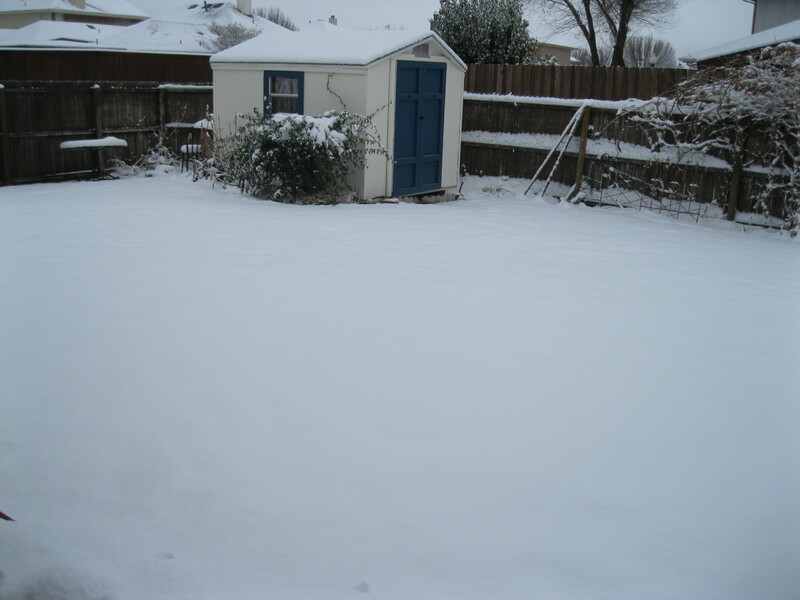 Once we arrived at Laura’s house all was revealed. 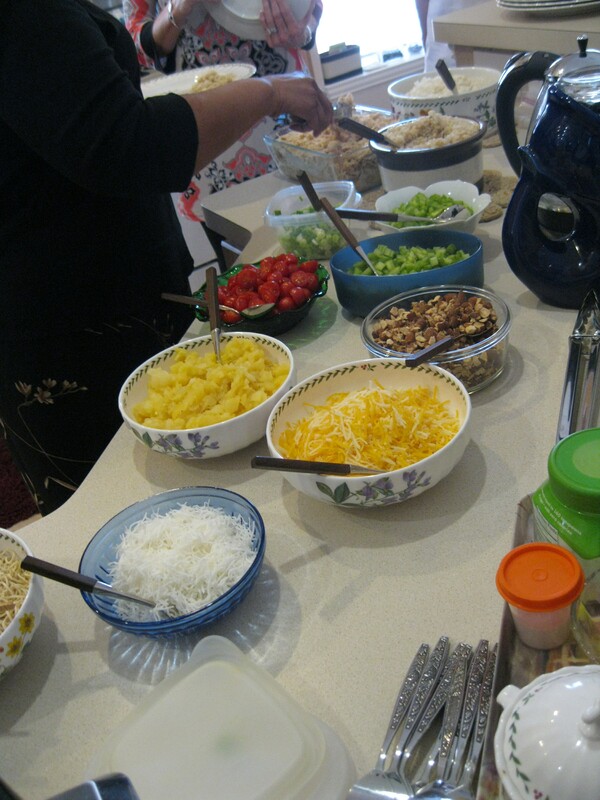 You arrange all the ingredients in individual bowls, then send people through the line buffet-style. (That’s pronounced “boo-fay” if you’re Hyacinth Bucket.) Start with rice, then add chicken, then stack whatever you like on top. End by pouring gravy over everything. 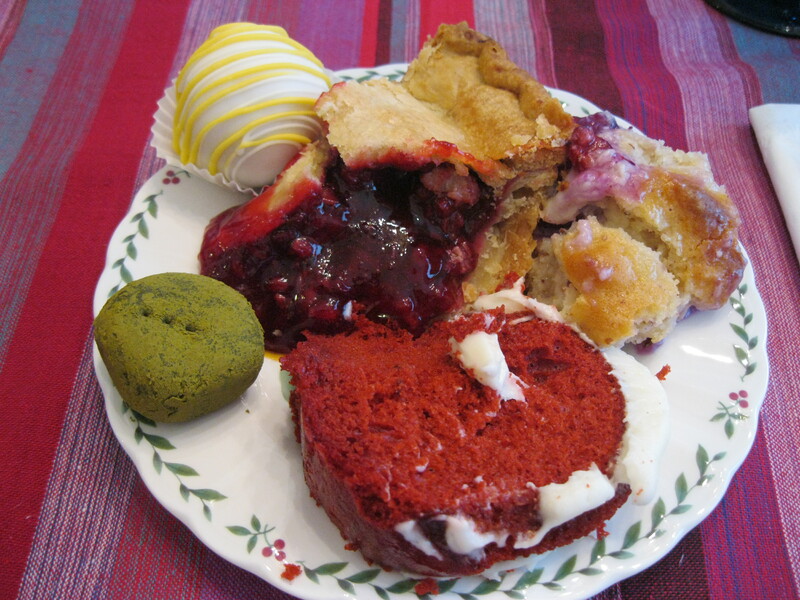 We like variety in our desserts. 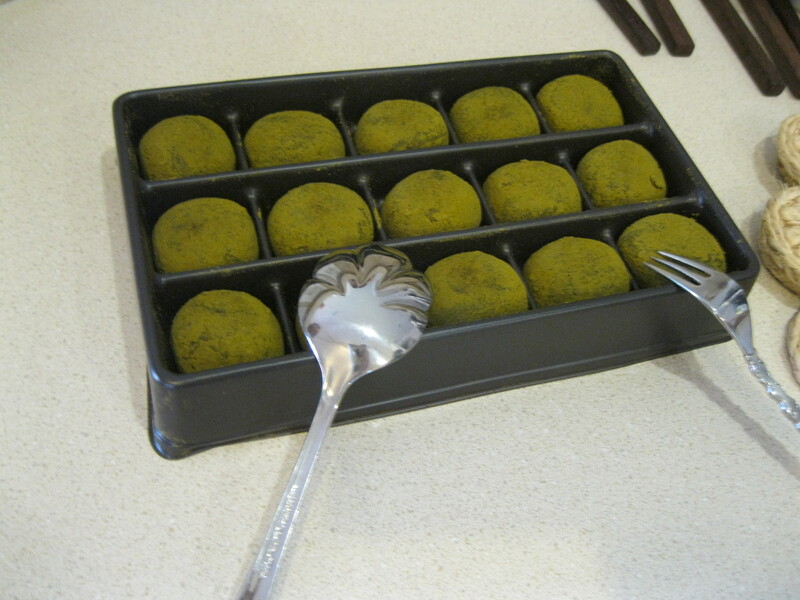 including Japanese green tea chocolates brought back from Japan by one of our own Hot Wings. Tasty in an odd sort of way. Not all, just all at my table. In case you’d like to do some stacking of your own, here’s the recipe! •	Shredded cheddar cheese, 8 oz. MAKE GRAVY: Pour ¼ cup chicken broth in a container; add the rest to a pan with both cans of condensed cream of chicken soup. Heat to boiling. Dissolve 3 heaping tablespoons of cornstarch in the reserved chicken broth and stir, then add to boiling broth/soup mixture. Stir until thickened. 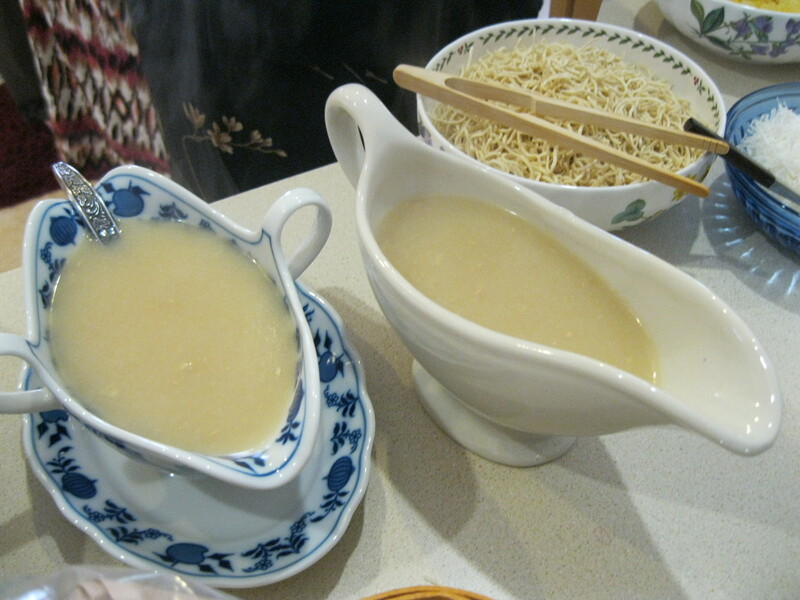 SERVE: Place all ingredients into individual bowls with rice at one end and gravy at the other. 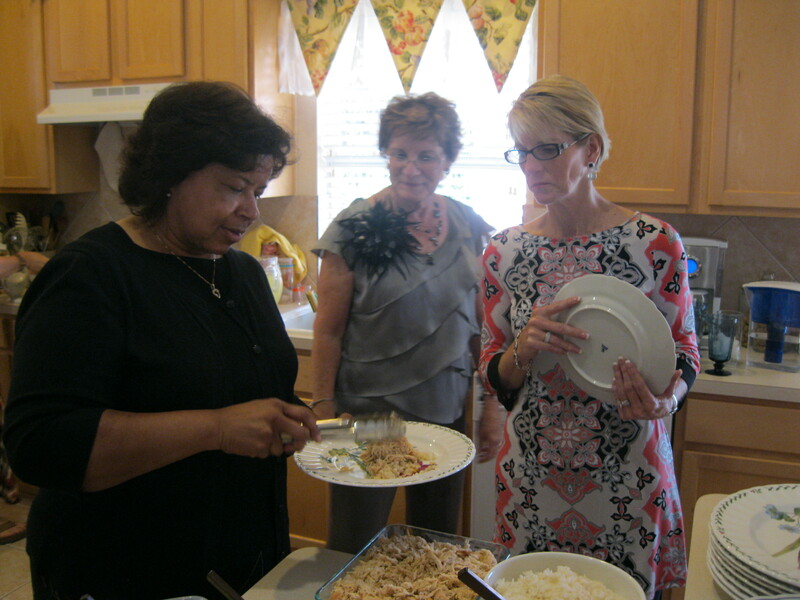 Guests “stack” their own plate starting with rice and chicken, then adding the additional ingredients of their choice, ending with gravy. Everything except the gravy can be done ahead of time and then it is easy to set out for your guests. This amount served 16 altos with plenty for several second helpings. *Our chicken was cooked in a crock pot with some Italian dressing; it was really moist. Remember the Enchilada Class, where I said I had 4 different enchilada recipes in my repertoire? I made one of them this weekend and thought I’d share. It’s a different taste from Vikki’s family recipe, but it’s also a heck of a lot easier and only requires four ingredients. That’s right. Four. Want to know what they are? At this point the meat is browning on the stove. So. Place your ground beef in a pan (non-stick cleans up easier) and brown it. 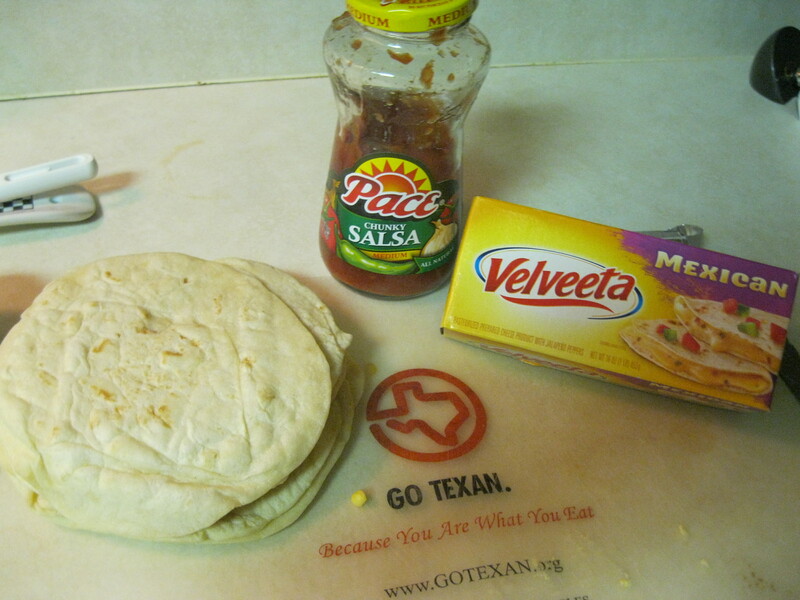 Add ½ cup salsa and half the Velveeta, which you have cubed so it will melt more easily. Let that get all bubbly. Still needs a couple of minutes for the cheese to melt. 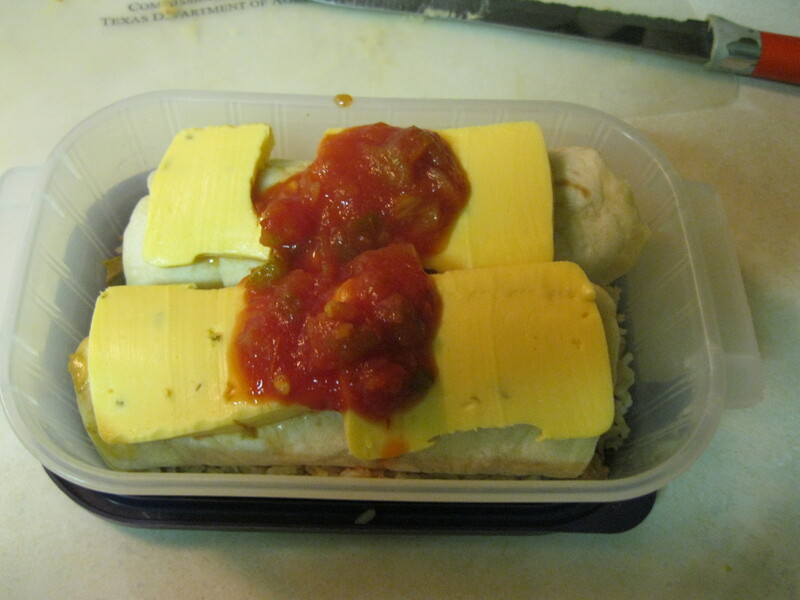 Place a couple of heaping spoonfuls on a tortilla and roll up. Since I like to make these in individual to-be-consumed-later servings, I’m placing mine directly into my plastic container, which already contains rice. (Brown. Plain. There’s enough flavor going on in the enchilada, you don’t need any extra.) If you’re making this for immediate consumption and/or for a group, place your enchiladas in/on the microwavable container of your choice. That’s right. Microwave. No oven required. So where were we? Oh yes, all our enchies are packaged and you still have half your Velveeta sitting on the counter. Slice it thin—this is easier to do when it’s cold—and drape over the top of your enchiladas like so. Add a little more salsa. Ready to heat or store. At this point, you may stick it in the microwave for a minute or so. How long depends entirely on how many you’re cooking at a time and how powerful your microwave is, so just stand there and watch it spin around. When the cheese melts, it’s ready. If you’re planning ahead, like me, you may instead place your servings in the fridge or freezer, depending on how long you expect it will be before you put them on the menu. When the time comes, nuke ‘em in the microwave until the cheese melts and it’s all bubbly goodness inside. If you’re starting from the frozen state, I find it’s best to let them warm up a little first and have been known to hack them in half to facilitate heating up the middle. Also, if you cover them in the microwave they tend to steam and the tortillas stay a little softer, which is nice. BROWN meat; drain. Stir in 1/2 cup of the salsa and 1/2 of the Velveeta. 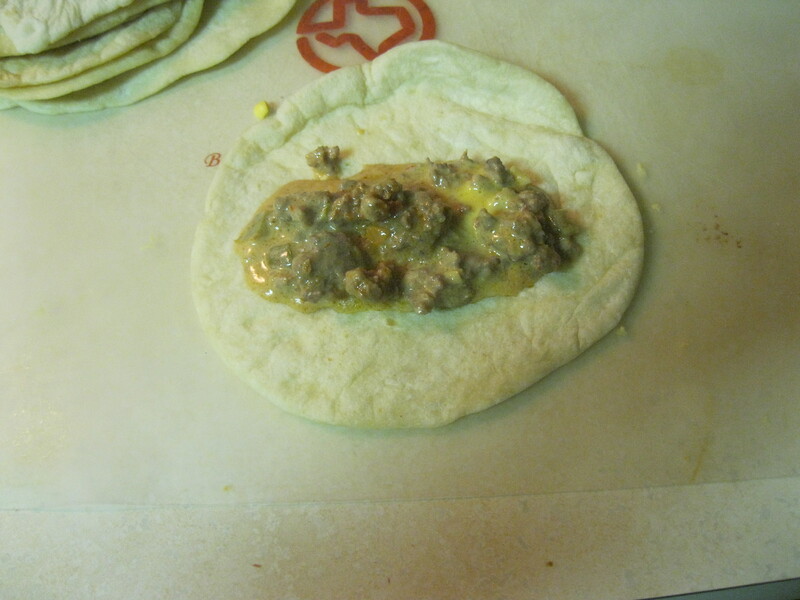 PLACE slightly less than 1/4 cup meat mixture in center of each tortilla; roll up. 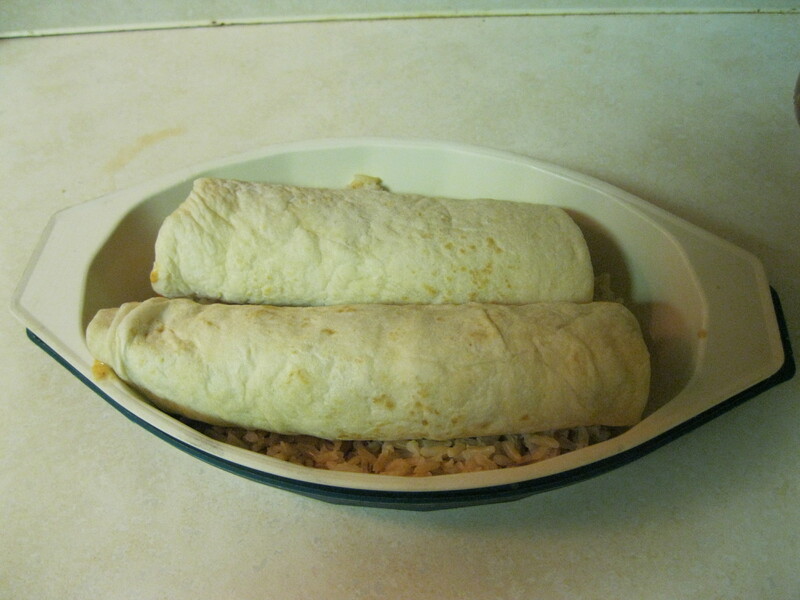 Place tortilla, seam-side down, in microwavable baking dish. 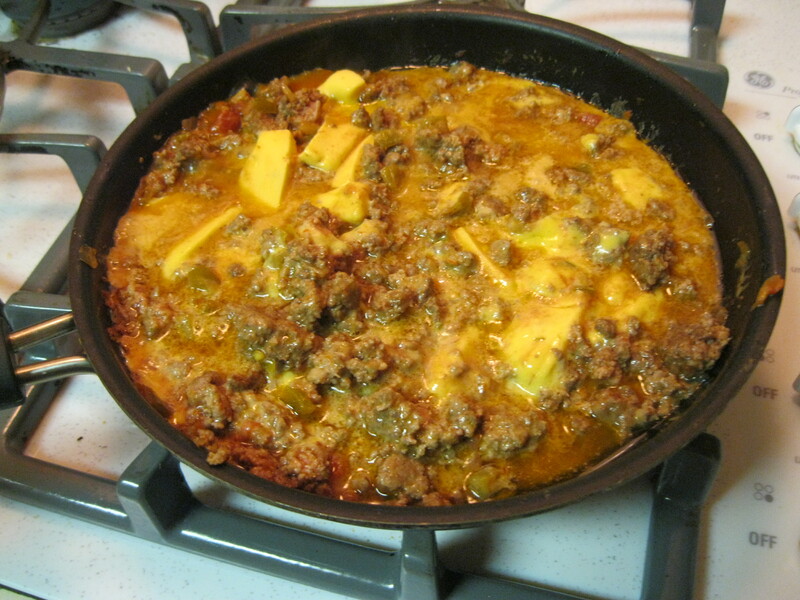 Top with remaining Velveeta and 1/2 cup salsa. Cover. MICROWAVE on High 4 to 6 minutes or until Velveeta is melted. Makes 6 servings. So . . . 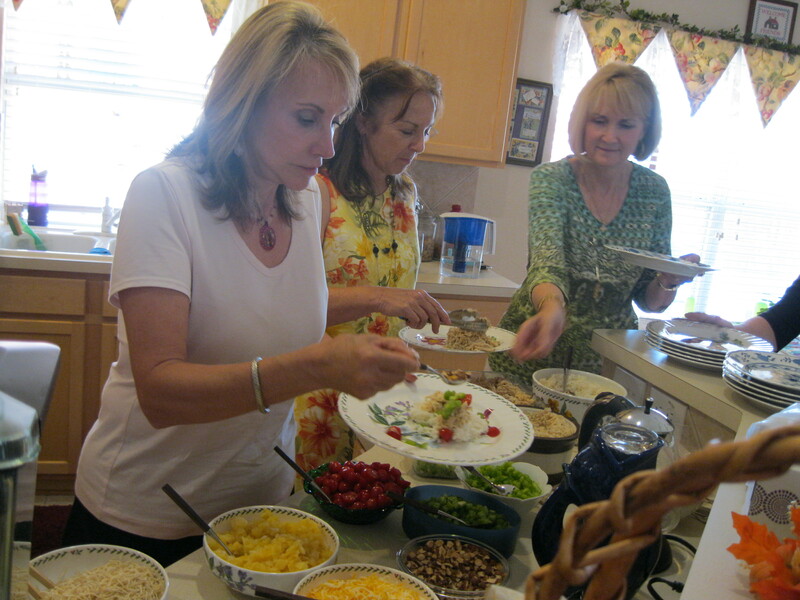 I had this rather fabulous New Year’s Eve slumber party with much food and merriment. The Bubble Bread from last week’s post made an appearance. 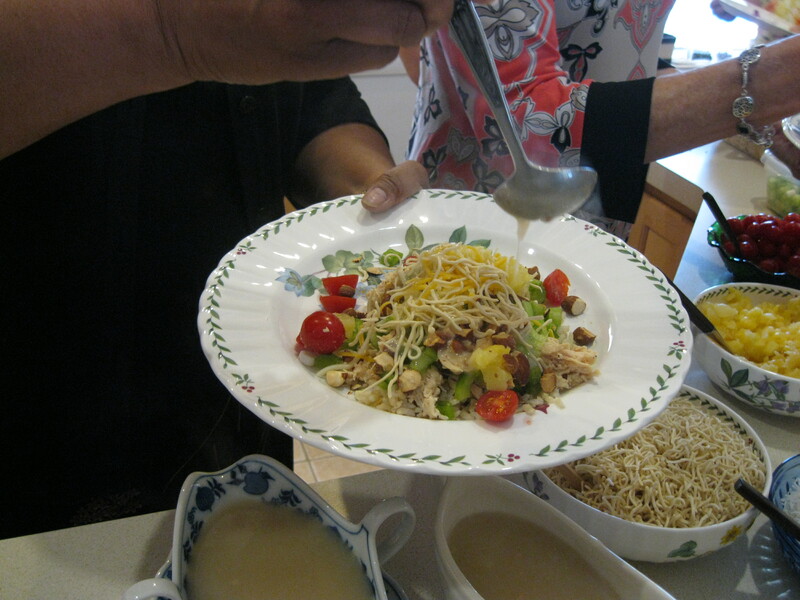 So did the following recipe, which we inhaled for dinner New Year’s Eve. I meant to take photos, but what with having a houseful of starving guests and all, it was pretty much gone before I thought of that. You’ll just have to imagine the goodness—or try it for yourself! The name “Chile Rellenos” apparently means “stuffed chile” but this is way easier than the usual more labor-intensive version. Think of it as a Mexican lasagna, with chilies in place of the noodles. Rinse chilies & split open (it’s easy, you can do it with your thumb); remove seeds and drain on paper towel. Brown ground beef, onion, and garlic. Add chili mix and cumin, stir well. Meanwhile, add evaporated milk to beaten eggs, then add flour to the mixture. Grease a casserole dish (I sprayed a 9×13 pan with Pam and all was well). Arrange half the chilies in the bottom of the pan. Spread half the meat mixture over it. Pour egg mixture over over meat. layer the rest of the chilies, the rest of the meat, and top with the cheese. Spread tomato sauce on top. At this point you can put it in a 350 degree oven for about 45 minutes, or you can cover it with foil and stash it in the fridge for up to 24 hours. If you do that, I’d just stick it in the oven while the oven is heating up and maybe add an extra 5 minutes to the total cooking time. You want the egg mixture to cook through and everything to get all hot and bubbly. Don’t let that egg thing throw you, btw, you won’t taste them as such in the finished product. Serve with sour cream and plenty of tortilla chips. Makes 8-10 servings, depending on how many chips they ate before dinner. I like to go with a citrus-y dessert after a Tex-Mex dish, so a key lime pie or lemon squares or something of that ilk would be delish. We had leftover Grand Marnier creme brulee, which was just orange enough to be delightful. *You could probably use somebody else’s chili mix, but that’s what my recipe calls for. It’s the kind that comes in a little envelope, generally found on the top shelf of the supermarket aisle with a bunch of similar little envelopes. Because . . . so many people are dealing with bad weather and this will take their minds off it. Because . . . we’ve all been eating healthy for weeks now (right?) and might need a little break from egg whites and chicken breasts. Because . . . it’s Wednesday. Because . . . oh heck, something this delicious doesn’t really need a reason. Especially when it’s amazingly easy to make. I give you . . . Bubble Bread. 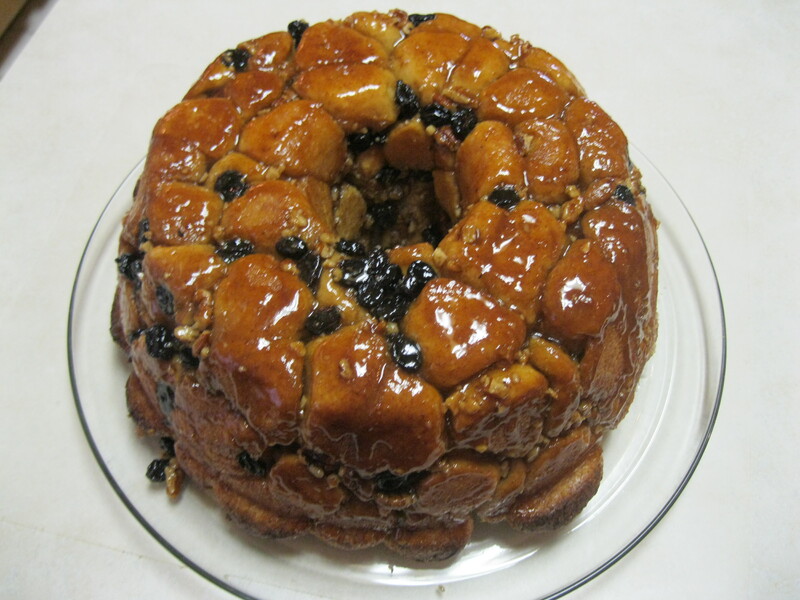 Some people call it Monkey Bread, but my experience has been that the simian version is vastly inferior due to the use of biscuits rather than proper yeast rolls. Place roll pieces in large bowl. Toss with dry ingredients. Pour melted butter over all and stir to mix. Pour into Bundt pan, place in cold oven, and go to bed. The next morning, stagger to the kitchen, turn on the oven and set to 350. Bake 30 minutes. Turn out of pan; let pan stay on top a minute or two to let all the sugary, glazey goodness drip onto the rolls. Remove pan. Remove yourself from the room while Bubble Bread cools, you’ll hurt yourself if you try to eat it hot. (Don’t ask me how I know.) Serve warm. I generally make people wash their hands then let them grab hunks of gooey goodness, but you can pull it apart with two forks if you’re fancy that way. Either way, happiness will ensue. Just a reminder of what's in store. Melt butter. Cut semi-frozen rolls into quarters and place in large bowl. Toss with dry ingredients, then with butter. Place in Bundt pan. Let rise overnight in cold oven (or 1 hour in warm over). Bake at 350 for 30 minutes. Turn out of pan; glaze will be on top. I think…just maybe…I found the recipe. Now, this has not been verified, nor has it been tested. But it sounds right. Feel free to make it—I’ll be happy to taste a piece and see if it’s the same as the one Collin made. Yes, it’s a sacrifice, but one I’m willing to make in the interest of culinary science. •	Stir. Depending on your microwave, continue to heat at 10 second intervals until chocolate is almost completely melted take out and stir until all chips are melted. I don’t know…but don’t let that stop you from trying it. With those ingredients, how can it be bad? Nothing ventured, nothing gained, right? Let me know what you think!